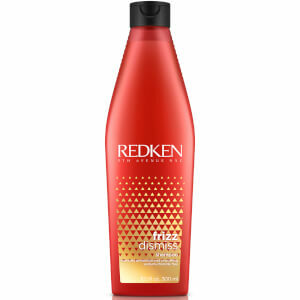 Take control of hair with the Redken Frizz Dismiss Instant Deflate Treatment, an oil-in-serum formula from the brand's reinvented Frizz Dismiss collection. Suitable for all hair types, the nourishing and frizz-fighting leave-in treatment helps to prevent excess volume, puffiness and frizz while improving manageability. Delivering an instant smoothing effect on moderate frizz, the hair-refining treatment contains sustainably-sourced Babassu Oil to promote a sleek and shiny results. 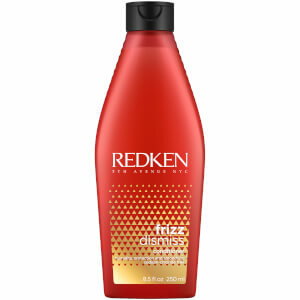 On Wet Hair: Apply to clean, damp, towel-dried hair after using Frizz Dismiss Shampoo and Conditioner to smooth hair. 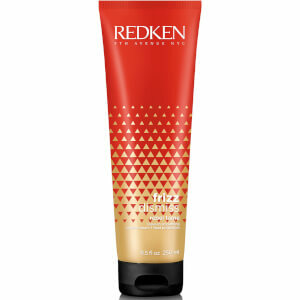 On Dry Hair: Apply to dry hair to instantly smooth frizz as needed. Cyclopentasiloxane Dimethiconol Glycine Soja Oil / Soybean Oil Parfum / Fragrance Orbignya Oleifera Seed Oil Benzyl Salicylate Benzyl Alcohol Linalool Hexyl Cinnamal Geraniol Amyl Cinnamal Coumarin Citronellol Limonene Benzyl Benzoate Citric Acid. This oil controls the frizz and volume in my hair – even in the rain! I have thinner hair so was sceptical about using a hair oil, but the application of the oil in a really small amount goes a long way on my hair. The bottle is big too which means its going to last me a long time. Realling nourshing on my hair, its naturally very thick and can get very dry unless I use a hair oil to give it some serious moisture. I like the application of this oil, it didn’t feel too greasy and I used a small bit on dry hair which worked well. I like that this oil is clear, I have used other ones before that were more yellow, I didn’t like the colour this left on my blonde hair. It also felt like it sat on the surface, this oil absorbed straight in. Good to use on wet weather days when that humidity creeps in. Stopped my hair from swelling up.